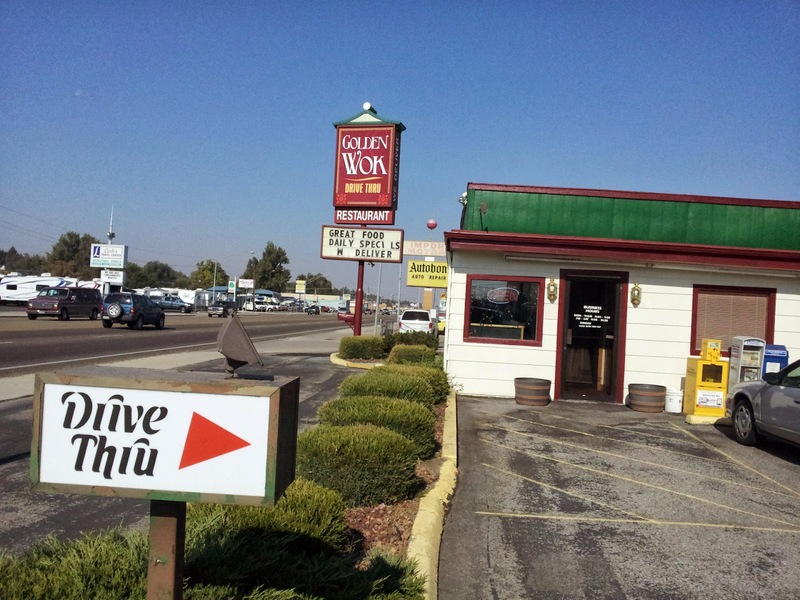 As the above picture shows, one of the more interesting things about Golden Wok is the fact that they have a drive-through, which is admittedly interesting for a non-chain Chinese eatery. Since I was just going for lunch, it would have been very convenient to go that route, but I was curious to see what the inside of the place would look like. After all, neither good eats or a nice place to eat them in are things that Garden City is particularly known for. Luckily that is all changing now, but Golden Wok has been around much longer than the current trend. One half of the L-shaped dining area. Cute, right? Clean, colorful, and the booths are in really good shape. So far, so good. 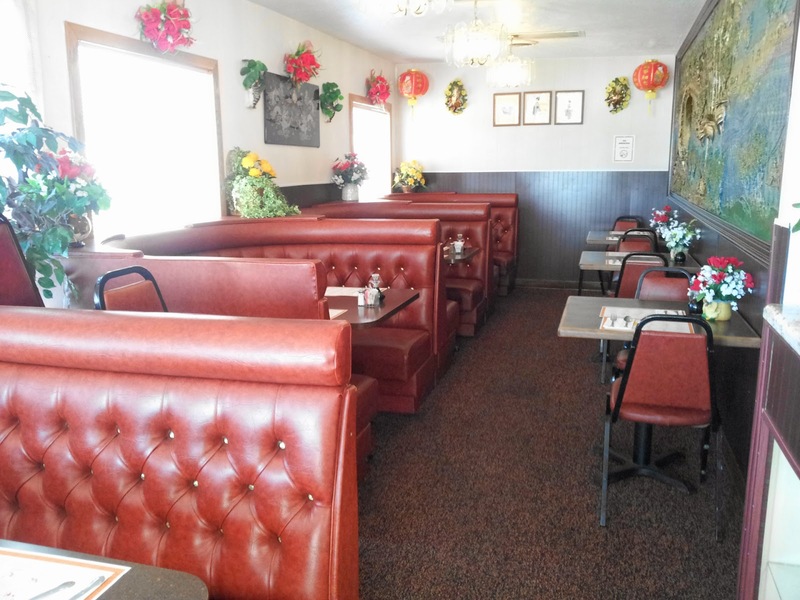 While it may be foolhardy on my part, I usually go with a combo of the usual suspects when trying out a new Chinese place because, let's face it, I have a lot more experience with them than I do with authentic Chinese cuisine. For less than seven bucks, I was able to get generous servings of sweet and sour chicken, broccoli beef, and fried rice. 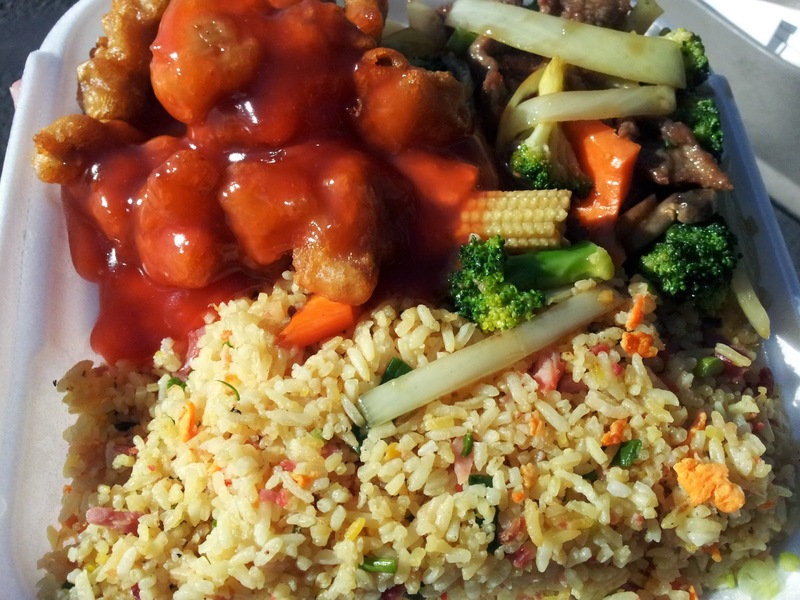 Clockwise from top left: sweet and sour chicken, broccoli beef, fried rice. The sweet and sour was the typical batter-fried chicken chunks in garish red sauce, not impressive but not terrible either. The fried rice was similarly unsurprising, but the broccoli beef did stand out a bit with the additions of large chunks of onion, carrot and baby corn. Safe to be sure, but not off-putting. I was intrigued enough for a return visit. This time I opted for the House Noodles, and due to my obsession with anything served in a roll form, I tacked on an order of Vietnamese egg rolls. I didn't love this, but to be fair it's not Golden Wok's fault. 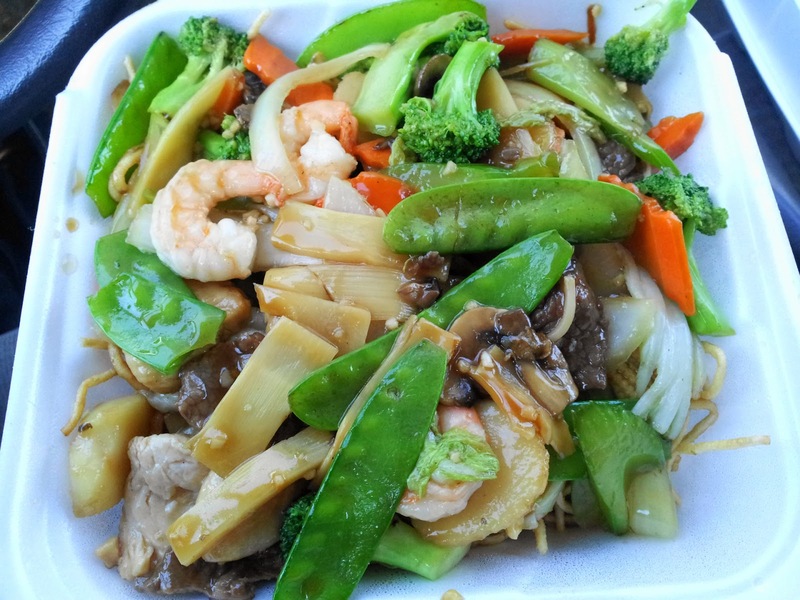 Once you've had Wok Inn Noodle's version, it's hard to find anything on its level anywhere else around here. That having been said, it's a very good dish, once again generously portioned and with lots of assorted meats and veggies. Wok Inn's version may be king, but this is still a very decent example of this item. I know I'm damning these guys with fain praise so far, but stick with me. 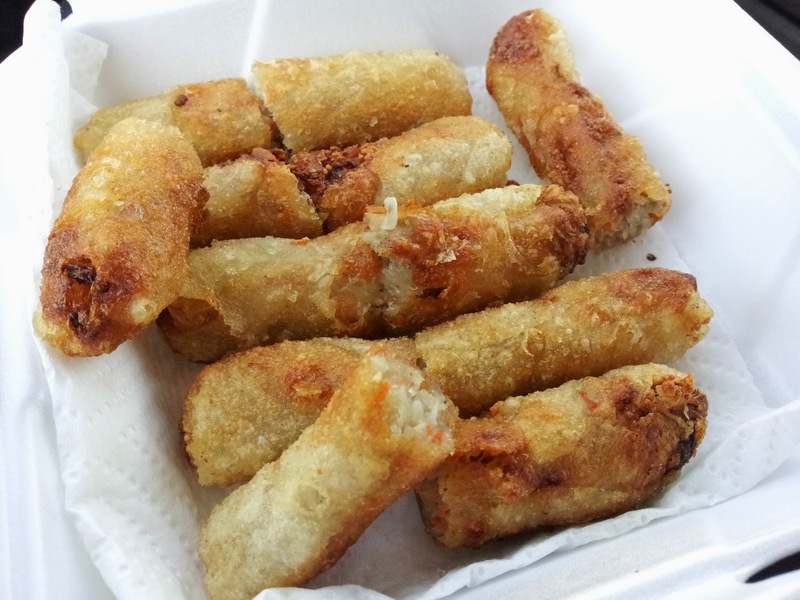 What you see above are not anything I recognize as Vietnamese-style egg rolls. The only other time I've seen a wrapper like that is on the buffet line at Jade Horse in Meridian. Still, this is the stand-out item in my experience with Golden Wok so far, and I'll show you why. Every once in a while, you'll be lucky enough to find an eatery that serves its egg rolls with a pile of lettuce leaves and dipping sauce. Often if you eat the rolls by themselves, they're nothing to write home about, but that's because you're not getting the accessories. Golden Wok is one of the places that does it right. 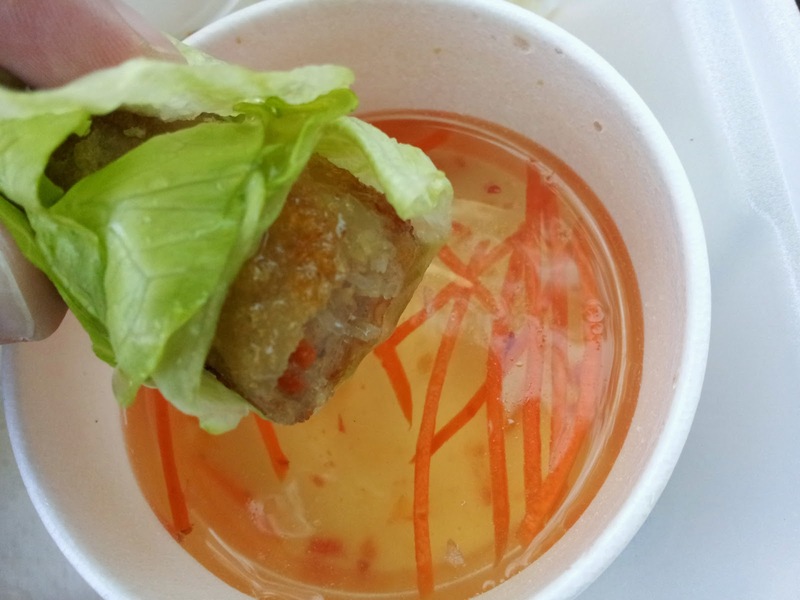 The lettuce gives the roll another, different type of crunch than the deep-fried wrapper, adds some welcome vegetation to the rice noodle-centric proceedings, and the usually fish sauce-based dip adds a depth and complexity of flavor that would otherwise be missing. I'm a little ashamed to say that most of my noodles went into the fridge to be saved for dinner later that night while I polished off the entire order of rolls while they were still at their peak of freshness. Hey, good is good, right? While everything else I tried made Golden Wok kind of an I-can-take-it-or-leave-it joint, this item makes me wonder what other worthwhile treats are hiding in their menu. I think it's safe to say that I'll return to find out. Food: Safe with a couple of surprises, which were luckily good ones. Value: Very good portions for the price. Service: No problems here, I think it would be a pleasure to dine in next time. Atmosphere: Clean and thankfully not at all oppressive.